Punch Bowl Social has been deliberate about growth since its first location opened in 2012. The company opened one unit that year, one unit the next year, and then two each in 2014, 2015 and 2016. But that will all change in 2017. Now with eight locations, Punch Bowl Social plans to add six units this year as it works to expand its high-volume “eatertainment” concept to more cities. Thompson referred to an opportunity in which developers give favorable deals in a bid to generate traffic, while customers eager for an experience populate the chain’s locations. More customers are shopping online, draining traffic at many traditional retailers. So many developers are turning to restaurants to generate traffic. 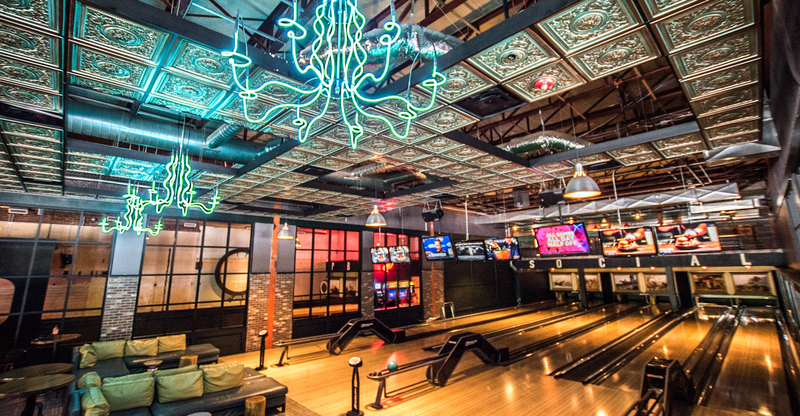 Punch Bowl Social builds large-scale restaurants of more than 20,000 square feet. In the current retail environment, in which customers are buying more goods online rather than at department stores, landlords are more eager for concepts like Punch Bowl Social to anchor their developments. And Punch Bowl Social has a group of customers, many of them younger Millennials, that developers fall all over themselves to attract. The result: They do much to help the chain open locations. That’s important for a brand whose build-out costs top $5 million. “We’re getting phenomenal real estate deals,” Thompson said. “Landlords are finding we’re beneficial to their merchant plan. Thompson, an award-winning restaurateur, created the concept in Denver, in 2010, with the plan to bring better food and cocktails to a food-and-games space traditionally focused more on the entertainment — which is often the more profitable side of the business. Most of the chain’s sales come from food and beverage — 89 percent, Thompson said. And he noted that customers originally come for the games but return for the food and drink. “Most people come to Punch Bowl Social to eat and drink,” he said, calling the games a “hook” to get people in the door. This has helped generate high volumes. The company’s new Minneapolis location is on track to do more than $11 million in its first year, although Thompson acknowledged that pace settles down. And make no mistake: Thompson loves the space. To be sure, opening that many units too fast can be a risk. But Thompson said evidence suggests his concept can make this step safely. For one thing, many of the chain’s units had strong years in 2016, and Punch Bowl Social’s first location, in Denver, had its best year ever. Additionally, one of the biggest names in the space, Dave & Buster’s Entertainment Inc., also had a great year in 2016. It’s also not an easy space to break into. And then Thompson goes back to the real estate question. He said the company is picking out strong sites, which on their own can help generate sales and traffic. And the deals landlords are providing to get a Punch Bowl Social into their development are enticing.